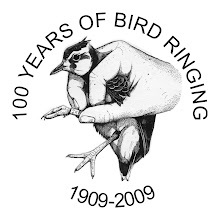 After our previous post about the Nunnery ringing group nest recording, Dave Leech realised that we were perilously close to recording our 1000th nest since the group began monitoring in 2006! This milestone has now been reached with a Blackcap nest (below) found by Rachael Portnall, about a metre off the ground on an ivy-covered wall in The Nunnery garden. Blackcap and Chiffchaff are the first of our migrants to lay eggs as they winter in the Mediterranean Basin and therefore have a shorter return journey than most. The first brood of Chiffchaff at The Nunnery hatched on Monday and will be ready to ring at the weekend. We don't have that many nest boxes on the reserve so a large proportion of those recorded by the group are open nesting species, such as thrushes, wablers, finches and buntings - these records are particualrly valuable as the total submitted to the Nest Record Scheme have been declining in recent decade. Other nests that have been recently found on the reserve include Skylark with a clutch of four (above), the first ever eggs of this species recorded here, plus several incubating Whitethroat and more Linnet on eggs. Some recent news from the BTOs Tawny Owl nest box which we previously reported: the ringed chicks are now 'branching', this is a term used for chicks that leave the nest and wander around the branches before they can fly. Thanks to Dave Leech for the photo.